Ultimately, it blossoms into a romance. Sunflower seeds cause a painfully delight dry mouth, the sun beams down onto welcoming bodies, covered in shorts and tank tops, and the only sounds that matter are the CRACK of the bat, WHIZZ of the pitcher’s heater, and SMACK of the ball finding a home in leather. Major League Baseball comes back with teasers from February through March, giving us a reminder of what is to come. It’s been long enough that we miss football, but are ready to embrace something different. That ‘something different’ finally blooms in April, which brings on a new wonder and magic to the spring and summer months. Baseball season is an almost like an extended holiday season, for avid and casual fans alike. Baseball means something different for everyone, but it connects us all. At some point, we’ve all played the game, been to a game, or at least learned how to throw a ball. It could mean a shot at a World Series title. It could mean adventures at the ballpark, united in team pride with friends and strangers. Or, it could mean the courage of a boy, mature and strong beyond his years, turning the game into something much bigger. In the majors, it means 162 games of survival, hoping to fail at a rate only two or three times more than success every day. It’s striking out two times to hit a game-winning home run in September. It’s uniting a community, a city, a country, with a magical run to the World Series in October. It’s the goggles to protect your eyes from stray champagne in the locker room. For Rockies fans, it’s another season of wonder. What will this season bring? New faces wearing the purple pinstripes, new breathtaking plays from Tulo and Arenado, new laser line-drives from CarGo. Will it be another fast start, rapid decline, like we’ve become accustomed to? Will we be swept up in the euphoric experience of another surprising playoff run? At some point, it will be nothing less than exciting, even if only for the first day. 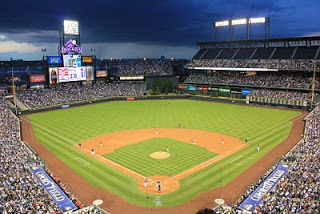 A trip to Coors Field always brings about a wonderous feeling. The majestic beauty of the mountains in the distance, the flawless and masterful artistic preparation of the field, the fountain bursting after a homerun and a Rockies victory. Though the season can’t be correctly predicted, one thing we do know is that summer days and summer nights can be best spent at the ballpark. A baseball game is more than a sporting event; it’s a social experience. Baseball gives an excuse to bond with friends, family, or total strangers over bad calls, towering homeruns, and highlight-reel catches. The magic of the ballpark combines chatter with songs, dancing with shouting, and of course hot dogs and peanuts with beer (or $7 soda, if that’s more appropriate). It’s a chance to meet a new friend, maybe a chance to meet someone that will have a huge impact on your life. A romantic interest, a new lifelong friend, a new business connection. It means something different for everyone, but it connects us all. It’s more than a game. It’s a chance for the high school ballplayer with cancer to have something to fight for. The dream, the one held by millions of kids, is still alive for him, despite certain limitations. For him, it’s throwing out the first pitch at a sold-out playoff game, wearing your favorite player’s jersey, surrounded by thousands of your biggest fans that don’t even know you. It’s battling through treatment, surgery, a metal knee replacement, but keeping a passion and a dream for the game. It’s smacking a game-winning double in the state championship game with only one good leg. It’s about making your mark on the lives of others, becoming an inspiration to all. It’s about more than just a game, it’s about the power of good spirits, and the power of a dream. It’s the younger brother, with the support and strength from the family, carrying on the dream and the legacy, and signing on to playcollege baseball. When the first pitch is thrown to signify the start of baseball season, it will carry a dream with it. In the Major Leagues, it will be a dream to be the best, to be the last team standing. At the stadium in Colorado, it will be the fans’ dream to have a World Series banner plastered on the green walls of majestic Coors Field. In youth leagues, it will be to one day throw that pitch, to hit that pitch, to be a hero. The wonder and magic of baseball is upon us. It means something different for everyone, but it connects us all. What does it mean to you? This story is dedicated to Nate Jurney, the inspiration behind many of these words, and his family- Mark, Sarah, David, Nicole, Daniel, and to everyone who has a dream.